The Dyess Colony project is a virtual reminder of the real life colony, begun by President Roosevelt. Five hundred families were chosen on the basis of need, farming ability and fitness–these families were awarded 40 acres and a mule (this was during the Depression) to come to Dyess and set up homesteads. Note: Tours venture into Mature as well as PG sims. If you are not able to access Mature rated sims (if you are below 18 years of age), you will not be able to fully participate in these tours. Our first stop will take us directly to the replica of the childhood home of country legend Johnny Cash. Next we’ll head to the “Colony Homes” street, with it’s examples of the home styles build in Dyess in the 1930s. Walking down the street to the east, we’ll work our way around the big white house (the admin building) and find our way to the general store, made to look much like the one in Dyess in the 1930s. On the other side of the circle, we find the Dyess Theatre, featuring photos of real life Dyess residents over the years. Right next door to the theatre is the Dyess Cafe, based on residents’ recollections of the real world cafe from the 40s and 50s. If we make our way west, back down the Colony Homes street, we’ll find ourselves in the next sim, in front of the Dyess Colony design office with its real life pictures of Dyess. Just around the corner is the Southern Tenant Farmers Museum, set in a representation of the Bank of Tyronza. Your media player will need to be working in order to fully experience the museum. Don’t forget to click on and teleport to the cotton field (the teleporter is in the small theatre at the end of the museum tour). 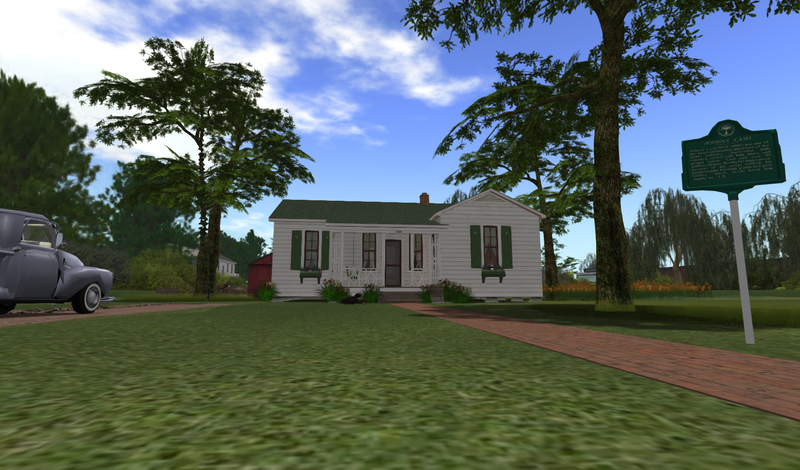 There are other historical builds scattered around the sims, including a Delta shotgun house (right across from the museum) and Lakeport Plantation in the sim to the south. Next we’ll head to Napoleon, AR, the underwater town. (note: as of 1/14, their media stream wasn’t working, but we can still tour). Head down the dock and jump in the water. Here we can see the virtual remains of a once thriving small farming town on the Mississippi River. By 1870, erosion from the Mississippi had caused the bank (with the town included) to topple into the river, becoming an underwater ghost town. Flight is turned off, so we’ll have to walk back up to the shore. Just down the path, we’ll find a carriage ride to the Lakeport Plantation. Each carriage seats two and you’ll be dropped off near the front door after a ride around the grounds. Please give us feedback on these tours, so we can make everyone’s experience a fun one!